Click to see the full truth--er--size image. What do YOU think is going on if not this? Are Billy and Barbie right to think this isn't happening? Click for the full-size upgrade--er--comic. I don't know about you but upgrading endlessly is my favorite thing in the world. BALLPOINT ADVENTURES for 3/23/15: Lies, Lies and MOAR Lies! Click to see the full-size lie--er--image. I feel like this is what happens every time a politician's lips move. Click to see the full-size violence--I MEAN--image. Even if you're a huge geek, you have to admit that fandom can get to be a bit much sometimes. It just occurred to me, 17 years later, that Billy should have killed the cosplayer with his own bat'leth. I'm embarrassed that after all these years I still remember how to spell "bat'leth". Click to make this week's joke funnier (not really--just click to see the full-size comic already!). More on the direness at hand in America next week on BALLPOINT ADVENTURES! In the meantime, why not go pick up a BALLPOINT ADVENTURES MEGA-T? Click to make "ARMAGEDDON" seem like a better movie (or to see the full-size comic). Because science fiction is never right about anything. Click to be an even bigger Apple fanboy (or to see the full-size image--same diff). I am an Apple Fanboy, but that watch, like the first iPad, is crap. Wait for AT LEAST version 2. Too expensive for a watch that will probably have less than 18 hours of operating time. Imagine a watch you have to charge EVERY night. I'd rather have my childhood Timex that I had to wind a couple times a day than an 1st gen Apple Watch. Click to make the missile--I MEAN--the image larger. 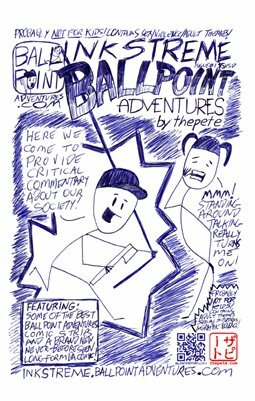 BALLPOINT ADVENTURES for March 2, 2015: Meet Your American Politician! Click to make a politician stupider (or just to see the full-size comic).